Melvin E. Brown was born and raised in Baltimore, Maryland. He attended Columbia University and is a graduate of the Johns Hopkins University Writing Seminars, where he received his M.A. 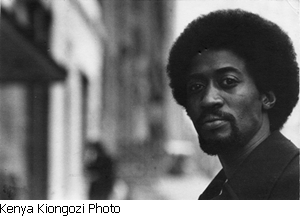 He has published two books of poetry, In The First Place and Blue Notes and Blessing Songs (Liberation House); and his poetry has appeared in various publications and anthologies, including City Paper, Southern Exposure, Hoo-Doo, Gathering Voices, Baltimore Renaissance Poetry, The Drumming Between Us and In Search of Color Everywhere. He has been the poetry editor of Chicory, a literary magazine of the Enoch Pratt Free Library, and Dawn Magazine, a publication of the Afro-American Newspaper. A lyricist for recording artists, he also has written for film and served as Assistant Editor of Blind Alleys. The founder of the Pamoja Writers Collective, Melvin is a faculty member at Sojourner Douglass College and Towson University, where he teaches African American Literature and Creative Writing.